As many of you will know if you read my 2013 Bucket List Blog, I have set myself the target of losing 20lbs this year. This is because I have gained a lot of weight over the past couple of years due to an under-active thyroid, for which I have to take thyroxin. 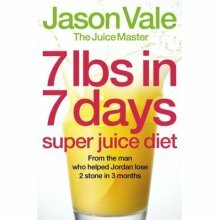 I decided to kick start my weight loss by doing the Jason Vale ‘Juice Master’s ‘7lbs in 7 days’ programme because I have done it before and I know it works! Jason is the man who famously helped Jordan lose her Mummy tummy through her juice diet-not that I actually like her or believed that until I tried it for myself after reading a ton of amazing reviews for the detox on Amazon. All of those people can’t be wrong! Lose up to 7lbs in 7 days with The Juice Master Jason Vale’s ultra-fast 1-week super juice cleanse. The man who helped Jordan to get her post-baby body back has designed a healthy and effective diet and exercise programme to reshape your body in just one week, but with lasting results.The one-week super juice diet with fast, body-transforming results from the UK’s leading health coach and seminar leader Jason Vale – aka The Juice Master. The man who helped Jordan get her slimmed-down post-baby body back has designed a highly motivational and hard-hitting programme for effective speedy weight loss. The ‘7lbs in 7 days Super Juice Diet’ can help you get in shape super-fast to give you a beach-perfect body or help you look sensational in that little black dress.With his simple diet and exercise programme and inspirational message, you will not only lose weight, but also have higher energy levels, clearer skin and be set free from the dieting trap forever.Not only will Jason Vale’s carefully designed juicing plan help you diet more effectively than ever before, it will also power-pack your body with nutrients and enzymes for the ultimate body boost and help you keep weight off permanently.Reshape your body in just one week by following Jason Vale’s effective juicing programme, and feel invigorated and energised while you do it! NB – Not a smoothie maker. My Worktop after my 7lbs in 7 days shop! As you can see, this is not a detox to be taken lightly! Lots of cravings for solid food and rubbish – remember these are all psychological! Towards the end of the first day, both times I got a killer headache. This is because your body is not having to process food, so your body can begin to process all of the toxins that it usually has stored, these cause the headache. To combat this – drink plenty to help flush the toxins out, and exercise, as it stimulates the lymphatic system which speeds up this process. You will start to feel really great on day 3. Lighter on your feet, I noticed a difference in the way my skin felt and looked already at this point, I also noticed my energy levels picking up, and getting out of bed didn’t seem like a struggle like it often does (especially at this time of year, when it’s darker). The cravings for solid food have eased off significantly, as I can see and feel the benefits and ‘see the light at the end of the tunnel’ (almost half way there)! Appetite significantly reduced, a feeling of general wellbeing, flat tummy and 5.5lbs lost to date! Lovely. My favourite juice is on this day, Sherbert Lemonade, and really does taste like fizzy lemonade! Step on the scales to alb weight loss (in my case). I also started the first day of his 14 day follow up programme. It is important to remember to phase yourself back into eating solid food gradually if you don’t want to get constipated! ← My Take on the Fatal Zorbing Accident in Russia – Absolutely Needless! I like the sound of this, ie I like the sound of losing this much weight in what appears to be such an easy way in such a short time. But… I have some reservations (quite apart from the cost of all that fruit and veg!). What happens when you start to eat normally again? The most successful diets I’ve read about are those which re-train your poor eating habits which for most of us (not you, I realise your weight gain was down to your medical issues) are the cause of the creeping weight gain in the first place. This is usually done by getting you to eat healthily and exercise more. Those type of diets make you lose weight more slowly (I’ve read that the most healthy amount to lose each week is 1-2lbs with 3lbs being the maximum) and slow weight loss is more likely to stay off rather than be regained once you go back to your “normal” eating patterns. Perhaps I should get the book out of the library and have a read to see for myself his rationale behind it and how he thinks it is healthy, especially for the longer-term juice-only programmes. I have taken up running since the New Year – I’m 2 weeks into a Couch-to-5k programme and quite enjoying it. Ian and I run 3 times a week or so, usually with the dog. Luckily Ian is very fit so he’s quite happy to take detours to pick up poo or track down a lost ball in the dark while I carry on running. I have yet to see any impact on the scales, but I suspect that could be because I’m still eating too much sugary stuff. Must break that habit somehow!! The programme is about seeing and feeling the benefits of healthy eating. My friend Leila and I both did this together and experienced the same desire to continue at the end. 5 days on, she has still not picked up a cigarette (she gave up her nicotine patches during the detox) or resumed drinking tea or coffee! Basically, you return to eating only 1 solid meal per day, which is salad. This alternates between lunch and supper. I admire your determination. I also have thyroid problems, but mine is hyper. It took the doctors years to figure out what was wrong with me. Now I’m on the right track and the disease is under control. They say in time my thyroid will switch gears and it will become under active. I never knew how vital the thyroid is until I began this journey. Take care. It’s horrid. I hear hyper is not much fun either… Still, I do wish I could have the inability to gain weight that goes with it… I’m used to being a skinny-mini, but recently not so much! I didn’t enjoy it much. I have Graves Disease, which is treatable, but no cure. Fortunately I reacted well to the medicine. However, if my number dips below the danger line they will have to remove my thyroid completely. It was an experience that taught me not to take life for granted. You never know what can happen. Very true! Last night as I was driving, I saw someone lying in the middle of the road, receiving CPR… You just never know when your time is up… I still feel shaken up by that now! That’s horrible. I’ll think positive thoughts for the woman–such a terrible thing to happen and to see. diet plan is basically a limited time effort to lose as much weight as possible. Yet there is more than one way to lose weight, and even if you only have 7 days to lose weight, you still have the future to consider, especially if you wish to continue losing weight after those 7 days are over.